ALMA and many other telescopes on the ground and in space have been used to obtain the best view yet of a collision that took place between two galaxies when the Universe was only half its current age, as seen in this spectacular space wallpaper. The Atacama Large Millimeter/submillimeter Array (ALMA) and many other telescopes on the ground and in space have been used to obtain the best view yet of a collision that took place between two galaxies when the Universe was only half its current age, as seen in this spectacular space wallpaper. The astronomers enlisted the help of a galaxy-sized magnifying glass to reveal otherwise invisible detail. These new studies of the galaxy H-ATLAS J142935.3-002836 have shown that this complex and distant object looks surprisingly like the well-known local galaxy collision, the Antennae Galaxies. In this picture you can see the foreground galaxy that is doing the lensing, which resembles how our home galaxy, the Milky Way, would appear if seen edge-on. 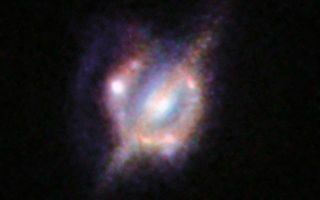 But around this galaxy there is an almost complete ring — the smeared out image of a star-forming galaxy merger far beyond.